Stir one heaping scoop of Healthy N' Fit 100% Whey Pro-Amino-into 8 oz. of lowfat milk or juice, or one heaping scoop into 4-6 oz. of cold water. Use one or two times daily between meals or as a quick meal to help produce a positive nitrogen balance for repair and growth of muscle tissue. You can also add 100% Whey Pro-Amino to oatmeal, pancakes, muffins, shakes and more. Everyone knows Amino Acids build more muscle than protein. Are you still using just whey protein? 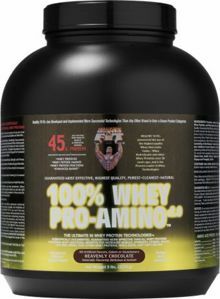 100% Whey Pro-Amino contains 45 grams of high quality whey protein, peptides and amino acids per serving. Healthy 'N Fit pioneered whey protein technologies in the 1970's, 80's and 90's and developed the first 100% Ion Exchange Whey Amino Acids. Now, entering into the new millenium, 100% Whey Pro-Amino...Independently tested and assayed as high quality, highly biologically active whey proteins and peptides; including Ion Exchange. * Whey Protein with beta lactoglobulin, alpha lactoglobulin, immunoglobulin and bovine serum albumen, whey protein isolate, whey hydrolysate peptides and amino acids, glutamine and rich in BCAAs. Healthy 'N Fit does the research, development and production of its own products, as well as those of other major companies, in our own state-of-the-art research, development and production facility. Thanks to you, now one of the largest and most modern in the industry.